Texas’ summer temperatures are sizzling hot. So, when things start to heat up, it’s crucial that your Houston home has an air conditioning system that you can count on. This means it will perform at its very best to keep you cool and comfortable—day in and day out. However, if your home lacks an efficient cooling system, don’t sweat it—the team at Clear the Air Cooling & Heating can help. 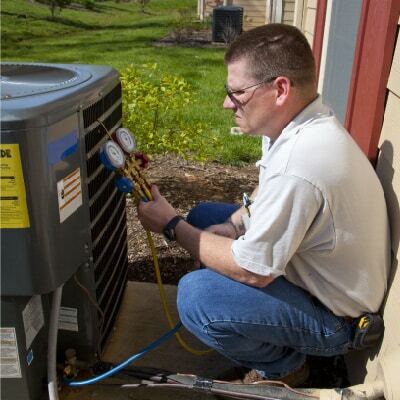 Our HVAC company stands behind our superior craftsmanship. And so, we guarantee that our AC installation and replacement services will keep you and your family comfortable, year-round. In fact, with our team on your side, we promise that summer is no sweat—literally. So, whether you’re building a new home in Houston or upgrading to a more efficient air conditioning system in Alvin, our skilled technicians have the expertise to help you select a unit that has the power to supply the chilled relief that your home needs, within a price range that your budget can afford. With us on your side, you (and your home) will never lose your cool. It’s no secret that a high-quality air conditioning system will boost your home’s energy efficiency and lower the prevalence of high electric bills. And so, it’s time that you experience the difference for yourself by choosing to install a new AC unit in your home. At Clear the Air, our HVAC contractors stand behind the belief that our clients deserve the very best. That’s why we only install the most dependable air conditioning systems on the market—and that’s Trane. By selecting a Trane system for your home’s AC installation or AC replacement need, you are choosing more than just a reliable cooling system. You are safeguarding your comfort for years to come—and your peace of mind—too. From AC maintenance, to air conditioning installations and AC repairs in and near Houston, TX, the team at Clear the Air promises our company’s high-quality air conditioning services and dependable cooling units will help you beat Texas’ heat for good. In fact, we guarantee it. And so, if for any reason your AC system does not work properly or its performance fails to meet your expectations, our team will fix it immediately or refund your money. No exceptions. At Clear the Air, our team is dedicated to delivering best-in-class service that you can rely on. And, our NATE-certified technicians are qualified to replace and install just about any brand or model of AC equipment from A to Z. So, you can count on us to turn your Houston home into a cool escape from Texas’ heat. To request an estimate for an HVAC replacement or installation, fill out our online form or call 281-612-1031today!